NASA's Solar Dynamics Observatory snapped this image of a massive X1.9 class solar flare on the sun on Nov. 3, 2011 at 4:27 p.m. EDT, The flare erupted from an extremely active region on the sun called AR11339. 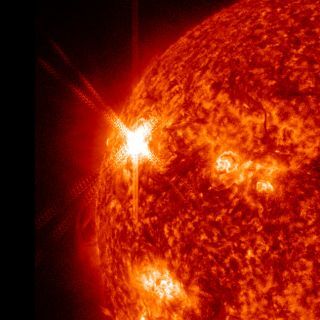 A powerful solar flare that erupted Thursday (Nov. 3) from a huge blemish on the sun's surface has been classified as an X1.9 flare, ranking it among the most powerful types of storms our star can unleash. The flare originated in a humongous sunspot that was sighted earlier this week, which is one of the largest sunspots seen in years. The event began at 4:27 p.m. ET (2027 GMT). The flare "triggered some disruption to radio communications on Earth beginning about 45 minutes later," NASA officials wrote in a statement. "Scientists are continuing to watch this active region as it could well produce additional solar activity as it passes across the front of the sun." NASA's Solar Dynamics Observatory and twin Stereo sun-watching spacecraft snapped photos and video of the huge solar flare during the solar storm. A flare is a powerful release of energy that brightens the sun, and is often associated with an area of increased magnetic activity on the solar surface. This magnetic activity can also inhibit the flow of heat to the surface in a process called convection, creating darkened areas on the face of the sun called sunspots. The huge active region on the sun right now, called AR11339, is about 50,000 miles (80,000 km) long, several times wider than the Earth. "This large and complex active region just rotated onto the disk and we will watch it for the next 10 days," astronomers with NASA's Solar Dynamics Observatory satellite wrote in an update. Later on the same day as the flare, in another area of the sun, a burst of charged particles called a coronal mass ejection released from the surface. This eruption came from the back side of the sun and is headed toward the planet Venus, so should not pose any risk to Earth. Because NASA has a suite of spacecraft observing the sun at all times from many directions, the agency was able to observe the coronal mass ejection as well as the solar flare. Scientists say we probably haven't seen the last of activity from this dynamic region of the sun. "The large, bright active region remains potent," officials from the National Oceanic and Atmospheric Administration (NOAA). "Odds are good there's more to come." And recent events are just part of a larger ramping up of action on the sun lately, as our star moves toward the peak of activity in its 11-year cycle around 2013.